The simple test of a good restaurant or hotel is their Caesar Salad. If the sauce is all mayo like and sweet – no good. If the yoke in the egg is hard – no good. If the lettuce isn’t crisp – no good. If the croutons aren’t tasty and crunchy – no good. 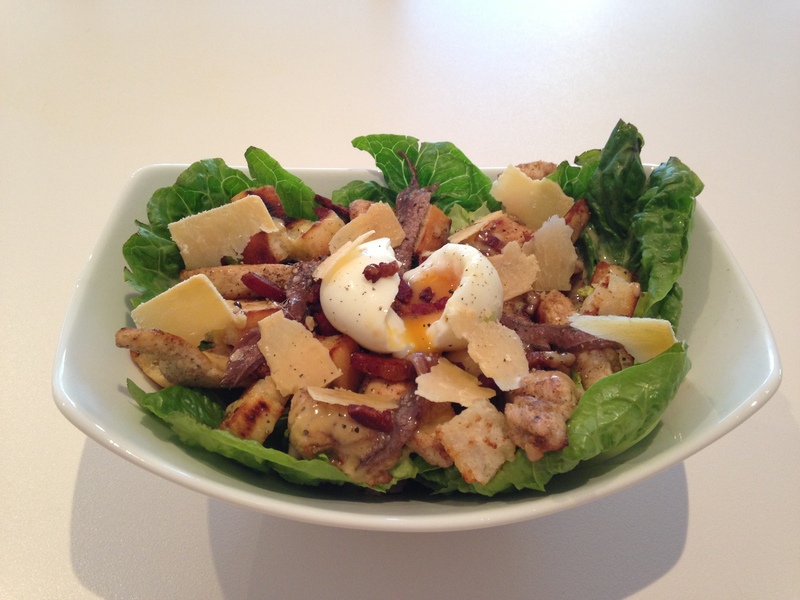 So here is my tried and tested Caesar Salad. For extra protein I’ve added some Cajun Chicken but an optional extra. First thing to do is mix all the dressing ingredients together in a dressing shaker or a screw top jar. Shake it well until it all mixed then set aside. If you are including chicken, cut the breasts into bite size strips and place into a glass bowl. Add Cajun dry rub seasoning and some olive oil to coat all the chicken pieces. Let marinate for at least an hour. In a fry pan add a little olive oil and when it is hot add the pancetta and cook on a high heat until it has started to crisp up. Then remove with a slotted spoon and drain on kitchen paper to remove any excess oil. I prefer batons for the pancetta as it ensures that the pancetta doesn’t fall through the salad to the bottom of the bowl. Fry the bread in the fat from the pancetta tossing frequently to ensure the croutons are crispy. Remove from pan, and as with the pancetta, drain on kitchen paper. In a small pot of boiling water place the eggs and cook for 4-5 minutes – no longer than 5 minutes! Remove from boiling water and submerge in chilled water for a few minutes until easy to handle. The cooling prevents the yolk getting overcooked. Peel the shell from the eggs and set aside. While the eggs are cooking you can also cook the chicken – if you are adding it. Remove from the bowl and add to the already hot fry pan. Cook until cooked through and browned all over. Once cooked, turn off pan and set aside until dishing up. Arrange large lettuce leaves around the bottom and side of the bowl. Chop some of the lettuce up for mixing in the with the other ingredients and add to bowl. Add half of the pancetta and half of the croutons. Drizzle with some dressing and mix together. Add the remainder of the pancetta, croutons then the chicken, anchovies and parmesan and drizzle with more dressing (you can put as much or as little as you like – its up to you). Place egg on top – you can cut it into chunks if you like. Sprinkle with parsley and add a couple of grinds of black pepper – serve immediately! As an alternative I’ve added roast turkey in stead of chicken and also tried other marinades. It seems to me though, that marinades with a bit of heat work best.